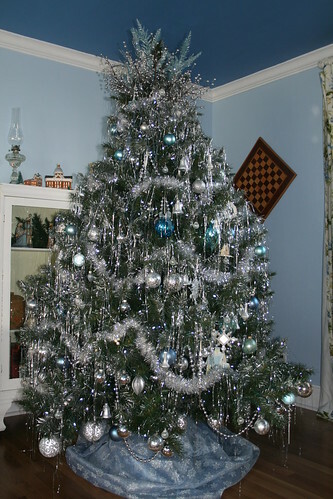 The Christmas tree in the guest room has a silver and blue theme, with a lean toward a vintage feel. The tree has white LED lights that have a bluish cast. The tree rotates. So much prettier in person, but you get the idea. 🙂 By the way, this is the tree I spray painted last year. Worked great!! You can see more Christmas decorating ideas at The Inspired Room. Scroll down that page for links to other sites where homes are being readied for the holidays. This entry was written by ~~Rhonda, posted on November 27, 2009 at 1:13 pm, filed under Christmas, decorating for Christmas, trees and tagged Christmas, Christmas 2009, christmas tree, guest room. Bookmark the permalink. Follow any comments here with the RSS feed for this post. Post a comment or leave a trackback: Trackback URL. My kids would just LOVE a rotating tree! Okay, I’m stealing the spray painted tree idea. That’s the spark I needed to get me excited about Christmas decor.